Ye he/she wouldn't be Aerial friendly, they can however have a move that's almost identical to Rolling smash from lk just a tad bit slower but hits alot harder with a ground pound stun finisher that has a 1sec stun. Everyone would flip or rather every gc player who mained Sieghart would flip if we got Sieg added to the Roster with the Soluna from the get go. Introducing Jf to elsword literally making him the best combo friendly character, Ara may have combo-chain system but it's more but honesly jf system is much cooler actually adds on to skills giving them extra hits also making much fancier combos that don't require you do use actives, hell imagine siegharts actives also having JF-addons? Really? I never liked Prime Knights gameplay, looked cool, hated it for PvE and PvP. I prefer Gladiator because of the Reverse Grip style. Though, if they ever did add Sieghart, they should make him a special character like how Luciel and Rose are special. He'd have 4 Paths like Rose, but each path would be based on his Job weapons from GC. This way everyone would be happy with it. There would actually be 4 different weapons for Sieghart unlike Rose which shares just Dual Guns. 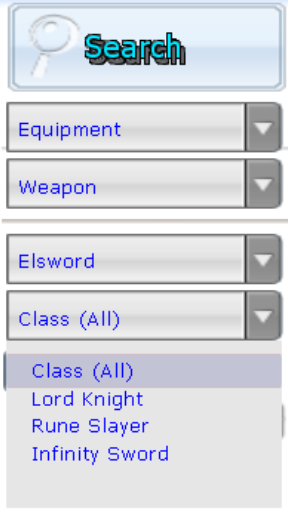 and because there would be 4 different weapons, you would have to actually use this Search Function for it. ^Which has no purpose right now anyways. I would never betray my waifu. That's quite exaggerated, 6 versus 7. Which would be 6 Males, 7 Females. It's always been uneven since Elesis was released. ntr lv bu O O?! Or they could like... throw in another girl for the lulz.